All the questions are written as though they are addressed to Mane6 directly and not to me, Rich Jammer, who is not a member of Mane6 staff. They are answered by me, so please do not regard this FAQ as gospel. As most of the questions do not have a definitive answer they will be updated as new information becomes available. This is not a full list of Frequently Asked Questions so if I missed any please inform me. All footage linked is of a Work in Progress game and does not fully represent the final product to be released. Where can I contact you for technical support? You can e-mail Mane6 at contact@mane6.com or if you have an account on the forums you can direct message the Mane6 account by starting a conversation with them. Any technical issues regarding backer access to the forums can be forwarded here and any issues/glitches with the forum site can be addressed here. When Will the Game Release and for how much? Game is already available for purchase at USD 14.99 or at a different price depending on your region. How Do I Unlock the Pixel Lobby Accessories from Skullgirls, Blazblue Centralfiction and GUILTY GEAR Xrd REV 2? "Owners of Skullgirls, Blazblue Centralfiction and GUILTY GEAR Xrd REV 2 on Steam will be unlocking these cosmetics to use on all characters in the Lobby automatically. No additional setup should be necessary there..."
How many playable characters will there be? There will be 6 playable characters on launch. 4-button Fighting: A-Light, B-Medium, C-Heavy, D-Magic. Magic System: Emphasize your character’s special abilities through a dedicated button and a unique resource. Juggle Decay: Opponents become gradually heavier during a combo, but ONLY after the juggle decay bar is filled. This manages combo length without imposing a hard limit. In addition, filling the juggle decay bar prevents standing infinites by removing the opponent's ability to remain standing for the rest of that combo. Enhanced Super Attack: Spend an additional meter to add utility to your main super attack with effects that stay true to the characters’ unique personalities and talents! Dynamic Music System: Rockin’ character themes that adapt in the heat of the battle makes every fight a treat to the players AND the spectators. GGPO powered netplay for the smoothest possible fighting game experience. Ranked/unranked matchmaking for quick and efficient fightin’. Visual lobby which allows players to explore (read: goof around in) locations within the world of Fœnum with other players. Customize your avatar with cosmetic items you collect through exploration and single/multiplayer gameplay! Are there any plans for DLC characters? There are plans to make one goat character as part of meeting one of the stretch goals. All future DLC characters have not yet been announced. Will the game be ported to X system? The game is only planned to be ported to Mac and Linux as part of reaching one of the stretch goals. At the moment, Mane6 are concentrating on releasing the game on PC and there are no plans to port it to any other system. "If it ever happens it will be much later"
No, but it does use the same engine which was provided to them by Labzero games. Beta is done. Go play the full game. Where Can I get the keys for the Game and other Backer Rewards When They Release? I have some Physical Rewards in my backer tier, what if I change my address? Update: if you can't update your survey because it is already closed. 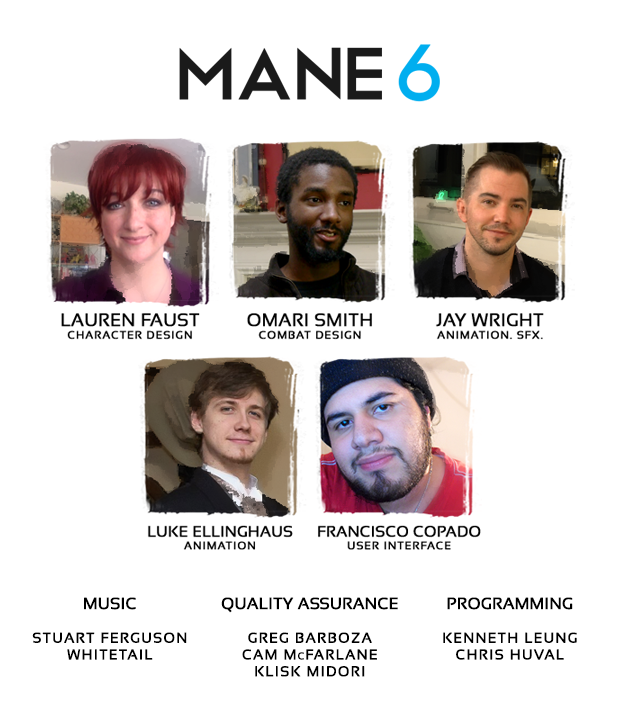 It would be advisable to contact Mane6 by email with your issue. Will this Game Support Mods? Where can I get some gameplay footage and Do you guys stream the game and when? Since the game has been released you can find many players streaming the game on Twitch and Youtube. Mane6 have stopped doing regular work streams but they may sometimes do casual streams. You can find them at their twitch channel. Oh, you guys on Social Media? I Missed the Indiegogo can I still contribute to the campaign? We’re not going to be having a late backers program. The reasons for this are mostly on the logistic side of things, but also because we’d like to keep the backers rewards exclusive to the backers that helped us during the campaign. We greatly appreciate your support for the game but we simply can’t do it. Can I still Support you Guys in some way? You can buy more copies when the game releases if you wish. You can also support Mane6 by spreading the word. Will the Soundtrack be available for purchase outside of the indiegogo? This is up to the music composer RC88. Will you Be Selling the TFH plushies to non backers? We may do a regular-plush run depending on interest once game releases, though. Depends on how well game does! We do not currently have any open positions. If any open in a future, we’ll announce it through this website, and update this page to match, so please keep an eye open! Can I Audition to be a Voice Actor in the Game? Update: the game is already fully cast. But maybe they may have openings in the future. For the sake of consistent quality, you will all be required to record in L.A. Meaning you will have to be physically present in Los Angeles, California, United States of America. Where can I meet people to play Them’s Fightin’ Herds? You are already on the forums so you can meet us in here. Also, hello, my name is Rich Jammer. How do you pronounce Foenum? How do you pronounce Tianhuo? He is Kenneth Leung, one of the programmers for Mane6. Is this a Pony Game? Is there any plans for Pony DLC characters? Those are some Longma's no(s?). Would there be any issue if I were to copy this and post it in another forum? I have no plans of doing so right now but I feel it'll be useful in the future. I feel like this thread should be stickied. You can e-mail Mane6 at contact@mane6.com or if you have an account on the forums you can direct message the Mane6 account. What is Them’s Fightin’ Herds About? Fœnum is a world inhabited entirely by sentient four legged, hoofed mammals. Across the land, these creatures have thrived much as we humans have, building societies and creating cultures revolving around the natural environment their particular species is indigenous to. Right now, Fœnum is dominated by these hoofed mammals, but this was not always the case. Long ago, the very lives of the Fœnicians were threatened daily by the presence of PREDATORS. Toothy, carnivorous beasts who were eventually BANISHED to a magical realm generations ago, ushering in a prosperous and peaceful era for the grateful grass eaters. But the time of peace is almost over. Countless packs and prides of Predators have discovered a way to escape their supernatural prison and are on the verge of infiltrating Fœnum en masse, led by the greatest and most horrible of them all! And so each nation of Fœnum has sent their strongest, bravest, most skilled of their race to face the Predators’ Leader and close the portal of the prison realm with an enchanted key. But it is up to each of these “Key Seekers” to become the one and only “Key Keeper” by securing the key for themselves – even if it means to take it by force! Which it does. Who will claim the key? Who will face the terrifying leader of the predators? And will she save Fœnum? You will have to play to find out! If you would like more you can access the extended lore. Please note as this was written early in the development cycle changes are expected. Estimated release date is April 15, 2017 according to the Indiegogo page. However, this is only an estimated release date and is not set in stone. At the moment, Mane6 are concentrating on releasing the game on PC and there are no plans to port it to any other system. Early 2017, first quarter of 2017 to be more precise. Where Can I get the keys for Beta and/or the Full Game and other Backer Rewards When They Release? ...all contacting regarding backer rewards will be done through the email provided in your IndieGoGo account…. Mane6 streams usually on the 3rd or 4th Friday of every month at 3 PM Pacific Time. You can find them at their twitch channel. You can also support Mane6 by spreading the word. You forgot that there are 2 sound guys. RC88 and Whitetail. Also, thanks for making this, Rich. Official mod answer: mind the derail. Added Disclaimer "All footage linked is of a Work in Progress game and does not fully represent the final product to be released"
Expanded On Question "How many playable characters will there be?" Spoiler: Who are the Mane6? Spoiler: What are the Features? Question Pending as not enough sources and list seems incomplete. Spoiler: What are the Game Modes Available? Also, I remember Jay saying on the Feb 2017 work stream that people need to be a SAG-AFTRA union member to be able to audition. I'm too lazy to go through the stream archive so can someone confirm this for me? If Jay's memory is serving him correctly, the VAs don't need to be part of the union, because this project can be used as a means to help them BECOME part of the union. Thanks man I misremembered so I'm glad I didn't put that in originally. Also you've been a big help to me in getting quotes for this FAQ since I just use your recaps. You're sounding alot like our Deer Leader Songhacker. Wow... Rich, you really spent time on this didn't you? Update: Added new Question "Will you Be Selling the TFH plushies?" Added extra answer and citation to question "Will the game be ported to X system?" "If it ever happens it will be much later"
"...Backer’s beta in the mid-to-late April zone"
"End of May is looking like the most likely candidate,..."
Who do we contact/how do we contact them, in case we need to fix something with backerthings, forum bugs, etc...? Updated with a link on how to download backers beta. Sorry for late updates, I kinda forgot about this place. "...We've got a few things in that list, and have been working over the last two weeks on getting them solved (as well as handling VO recordings, but that's news for later). Once these things are taken care of, we'll be lifting the NDA on Backers' Beta. We won't be giving you a specific date yet..."
What are the Terms of the Non Disclosure Agreement? If you have backer's beta access you can find full details here. Mane6 have stopped doing regular work streams but they sometimes do casual streams. You can find them at their twitch channel. Updated and added new information based on recent news. Also, had to trim some sections as I was going over the word limit. Will you choose your display name or will it take it from steam? It takes it from Steam. You need the 2nd Encode upgrade. That means all DLC characters, voiced character story mode, challenges etc. Just need to double confirm this please. Is there a place on the forums for introductions? Also curious if there's a way to learn about the characters and world of the game here or elsewhere. Wikipedia maybe? There is a book of lore on the homepage. Personally i liked Oleander's one which is part of the reason I chose her as my main. Now that I have the game & just started yesterday, I'm curious about the patch updates of the past. Are they automatically in the game, or do I need to find and download them? Steam automatically updates all games, there's no need to be concerned about finding external patches. You just need to not be running the game and it will do it for you. In the future when the game is beyond 1.0, will there be console versions? And in the case that there will be a conosle version, will it allow cross play? Would you guys put the game on any platform aviable after the game is done? Oh, I would LOVE for this game to make it to playstation! Though I imagine console capability won't be for quite some time. I’d imagine that console releases wouldn’t be out of the question after the Mac port.